T he Aquarius/SAC-D mission, launched on 10 June 2011, was a joint venture between NASA and the Argentinean Space Agency (CONAE). The mission featured the sea surface salinity sensor Aquarius and was the first mission with the primary goal of measuring sea surface salinity (SSS) from space. Data from Aquarius played a large role in understanding both climate change and the global water cycle. This instrument carried 3 radiometers and 1 scatterometer operating at 1.4 GHz & 1.2 GHz, respectively. The data collected by the radiometer were used together with sea surface temperature collected from another platform(s) to derive salinity data, and corrected for surface roughness using data from the Aquarius scatterometer. On 7 June 2015 at 12:53:17 UTC the Aquarius/SAC-D observatory suffered a mission-ending hardware failure resulting in the permanent cessation of data flows. The entire Aquarius data record spans a full 3 year, 9 month period from 25 August 2011 to 7 June 2015. Radiometer – Three L-band microwave polarimetric radiometers to measure the brightness temperature of microwave emissions from the ocean surface with a center frequency of 1.413 GHz. Scatterometer – L-band, polarimetric scatterometer provides information to correct for ocean surface roughhness and shares the antenna with the radiometers. It has a 373 km wide swath, transmits in a protected 1260 MHz frequency, has a 4 MHz band width, and makes 5.6 measurements per second in vertical and horizontal polarizations. This video provides a global tour of sea surface salinity using measurements taken by NASA's Aquarius instrument aboard the Aquarius/SAC-D spacecraft over the period September 2011 through September 2014. Red represents areas of high salinity, while blue represents areas of low salinity. Aquarius is a focused effort to measure sea surface salinity and providing the global view of salinity variability needed for climate studies. The mission has been a collaboration between NASA and the Space Agency of Argentina (Comisión Nacional de Actividades Espaciales). For all Aquarius technical documents, listed by version, and including the final Version 5.0, click HERE. 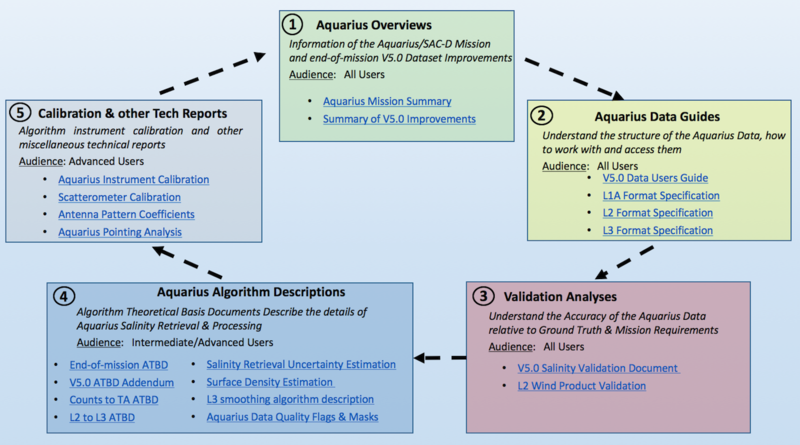 Note: All Aquarius technical documents, including for prior versions, are available here.